As windfarms and solar parks are brought online to help meet renewable energy requirements, power transmission projects are necessary to deliver the power needed from the new facilities and to the new areas. 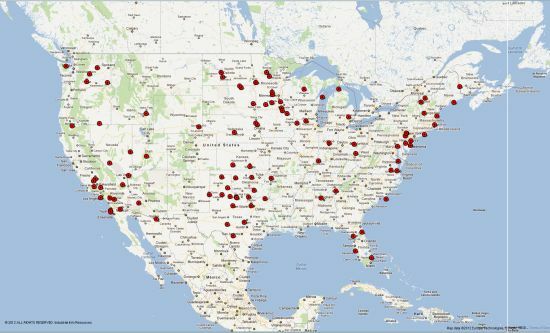 Industrial Info's Power Industry Project Database currently shows 54 power transmission projects that are scheduled for completion this year. One of the largest power transmission projects scheduled for completion this year is San Diego Gas & Electric Company's Sunrise Powerlink 117-mile, $1.883 billion 500-kilovolt electric "superhighway" from Imperial County to San Diego with 1,000-megawatt capacity (enough energy for 650,000 homes). The project started construction in the fall of 2010. Construction firm PAR Electrical Contractors Incorporated is now scheduling for completion before the end of the year. The projects have an aggregate total investment value of $5 billion. 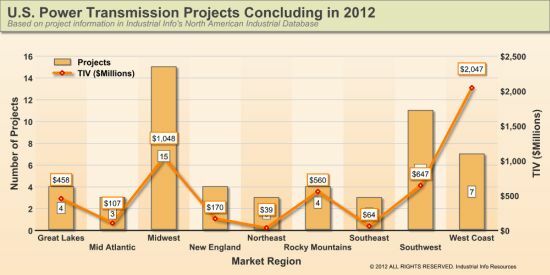 IIR is tracking an estimated $48 billion in transmission and substation projects set to kick off in the next five years. One of the largest of these projects is Clean Line Energy Partners' Plains & Eastern Clean Line 800-mile, $3.5 billion, 500-kilovolt, 3,500 megawatt capacity transmission line from Texas County, Oklahoma, to Memphis, Tennessee. The project is planned to be in service by 2016.